Where does your garbage end up? Hopefully, it is recycled. But this relatively new tradition has not yet reached many places around the world, where hundreds of hectares of land are swallowed up by landfills and waste dumps. An infamous rubbish dump just outside of Guatemala City is the biggest landfill in Central America, with 16 hectares of land covered with all sorts of trash. Known as Zone 3 or Basurero, which stands for ‘dump,’ it receives a third of the country’s total waste. On one end, the dump neighbors the shacks of the ‘miners,’ and on the other – the city’s cemetery, which is perched just outside the Basurero. When the family of someone buried in the cemetery can no longer pay for the spot, the coffin of the deceased is simply dug up and dumped into the pit – after all, Guatemala has no restrictions on things that can be dumped there. Some locals compare ‘the Mine’ to a wild beast, and many believe the place is haunted by evil spirits. Forming an enormous pit, ‘the Mine’ is rapidly growing, with tons of rubbish dumped there every day. Twice a year, floods cause deadly landslides, often burying rubbish ‘miners’ alive. Still, for many Guatemalans, the Basurero is the only way to put food on the table, even though they have to breathe toxic fumes and dig through hazardous materials to do so. One more dump that provides income for locals not afraid to dig through garbage is right on the outskirts of Cairo, Egypt. It is a dump, and it is a town – all in one. Tens of thousands of people live in the Zabbaleen community, and all of them live off recycling the neighboring capital city’s waste. 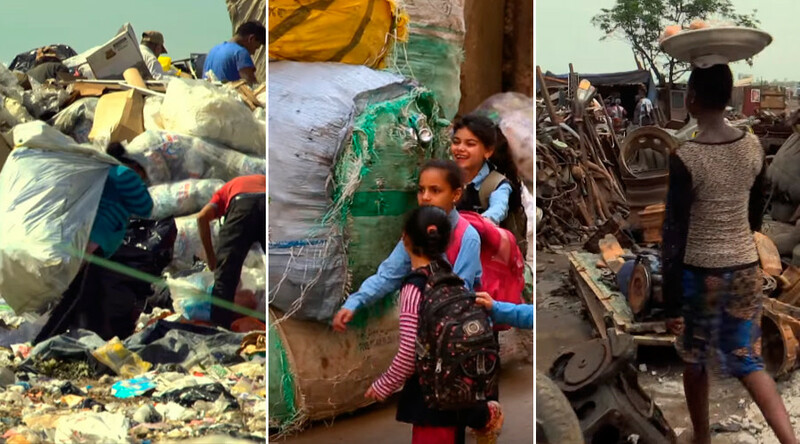 The giant dump gives them practically everything – from kids’ toys to fodder for livestock. They actually keep livestock – namely pigs – to process the organic waste of Cairo residents. ‘Zabbaleen’ is a word which literally means ‘garbage people’ in contemporary Egyptian Arabic. And the population is huge – between 50 to 70 thousand people live to collect garbage, according to 2006 figures. Every one of the rubbish collectors plays their own part – they gather, transport, and sort the refuse. This way, as every member of the community performs their own job of recycling Cairo’s rubbish, the trash town is self-sufficient and practically independent from the rest of Cairo. The dump even has an unofficial mayor, shops, cafes, and a school for local children, the majority of whom end up as the next generation of ‘garbage people.’ Yet, the Zabbaleen feel no shame in their occupation, priding themselves in providing for their families and fulfilling a socially important duty. Did you know that Ghana is one of a number of African countries where electronic goods end up after being discarded by developed nations? The site of Agbogbloshie is an enormous dumping ground near the city of Accra, where old or broken digital appliances, known as e-waste, are dumped and dismantled. Agbogbloshie covers an area of 10.6 hectares, which can be roughly compared to 15 football pitches. And as Agbogbloshie workers usually burn off plastic casing to uncover metal components of electronic appliances that end up there, the air is filled with extremely toxic chemicals. There are no safety regulations at Agbogbloshie, and those who live and work there are exposed to deadly health risks on a daily basis. Locals call the site ‘Sodom and Gomorrah.’ Yet, they see the waste industry as a source of employment and income.